well here we are at monday, looking back on some very real tragedy from the week passed. if ever there were circumstances to challenge the depth of the warmth and gratitude that we created over the holiday then this was it. it’s almost impossible to know what to say or do during a time like this. heartbreak and sadness have a tendency to stop us in our tracks in that way, but we have to do something. make real decisions about priorities that will keep our light as human beings alive & bright. I saw this quote posted on social media earlier this week & it has been running through my head over and over as a kind of a mantra to keep me focused on what matters most. so I’m choosing to stay soft, stay kind. in every way possible. and creating awareness of ways to put this choice into material, tangible form. for me this means telling my people how much I love them. staying present. 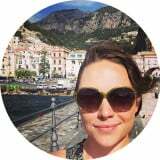 looking for small ways to help those in my little corner of the world. and continuing to cook food and share recipes with you. because sometimes food can say so much more than words. 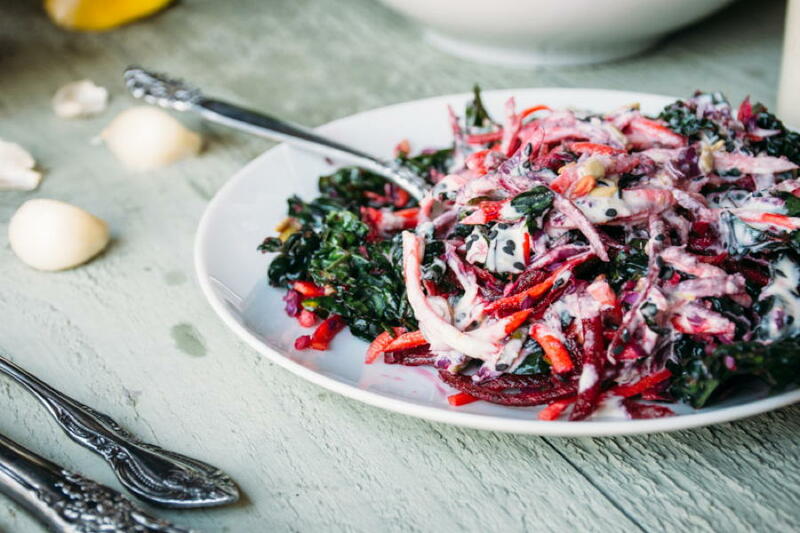 this week that dish is a vibrant kale salad with a tahini and chili dressing. 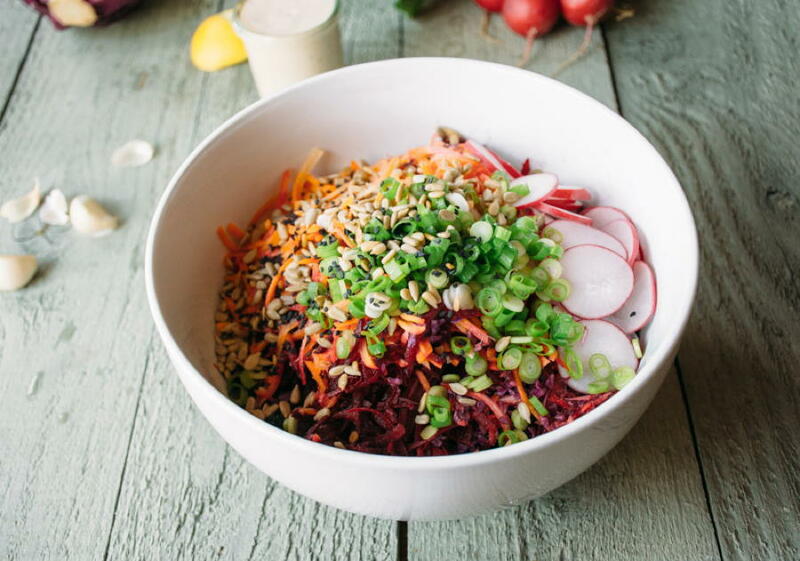 there’s beets, carrots, cabbage, radishes, green onions and some sesame and sunflower seeds for added crunch. it’s a light dish but also hearty enough to keep us going. 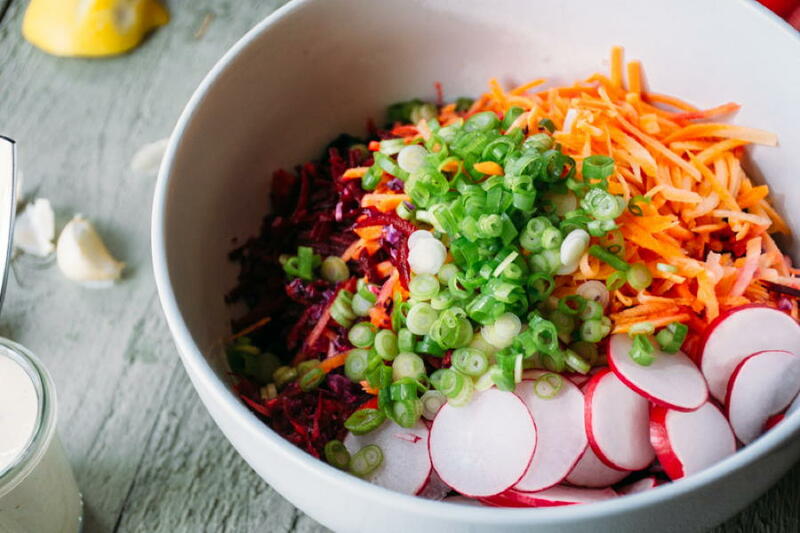 a salad that helps us take care of ourselves so we can make sure that we have some extra of whatever we want to give to share with the world. this is another massaged kale recipe, so get ready to get your hands a little dirty :)…it’s really my favorite way to make a kale salad. 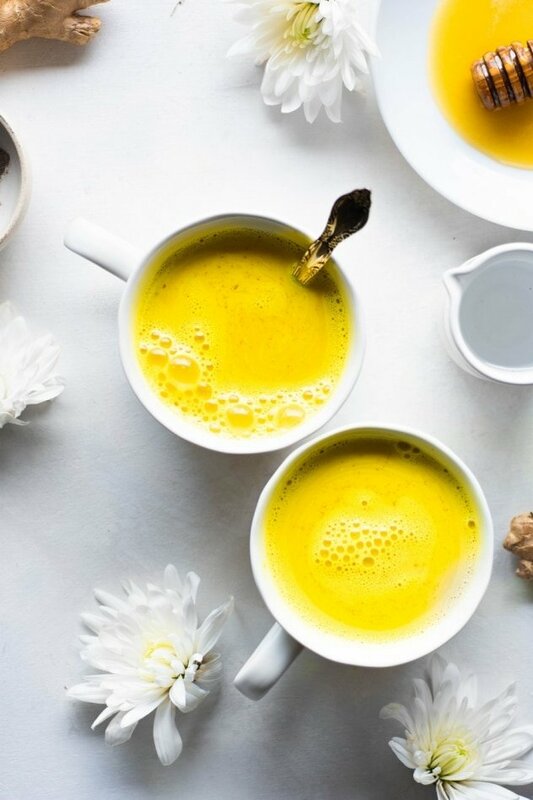 it feels easier to digest and more flavorful, and also more likely to pair well with other vegetables and dressing. 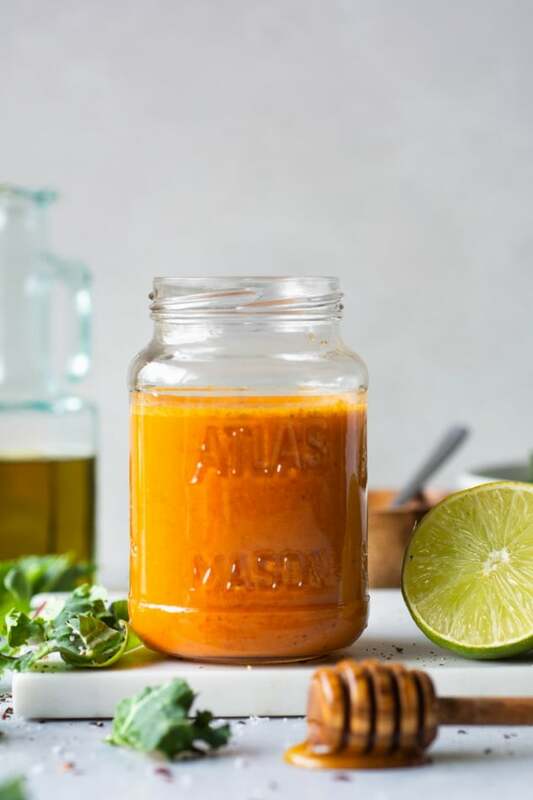 the dressing comes together quickly in the food processor, and you’ll probably have a little bit more than you need for the amount of salad that this recipe makes. if you save it it makes a really nice dip for some fresh veggies, or can be served along side your fried eggs in the morning for a little something different. if you store it in the refrigerator it will thicken up quite a bit! 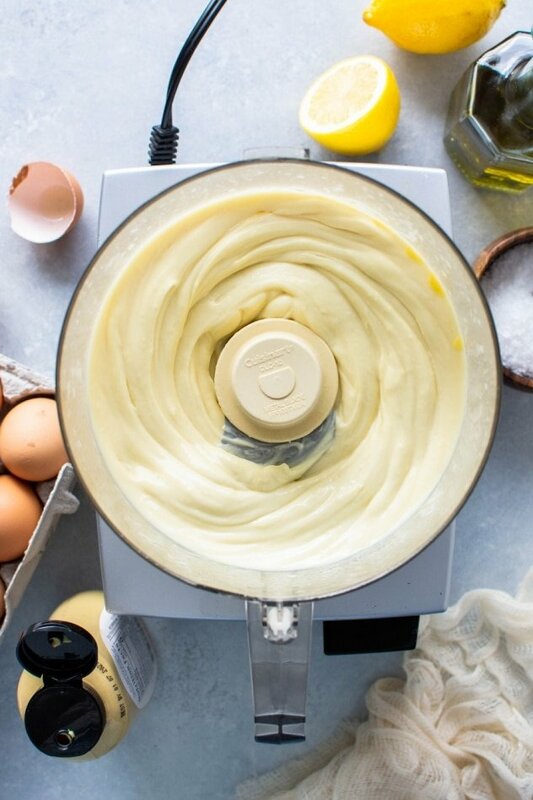 so if you’re making ahead and planning to do this, I highly recommend letting it sit at room temperature for a little while before serving so it regains a good consistency. 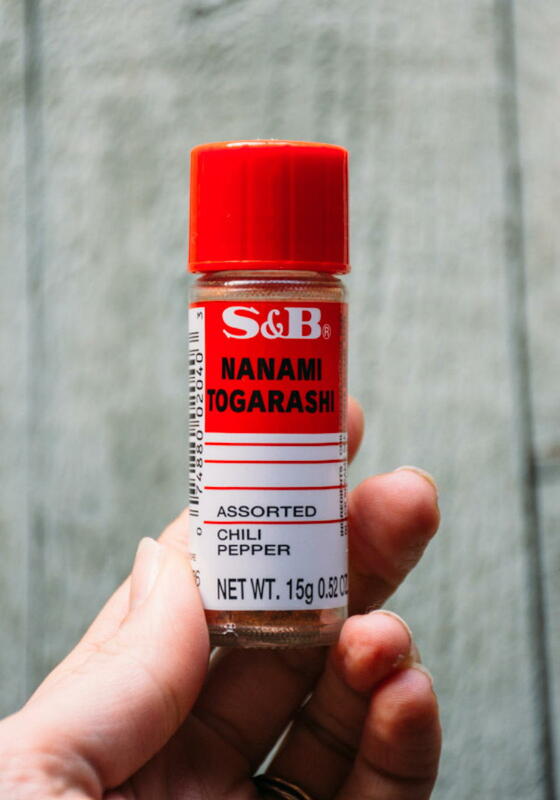 I used this “seven-flavor chili pepper” to add a little something special to the dressing (it has red chili, japanese chili, orange peel, black and white sesame seed, hemp seed, ginger and nori) – it has a really unique flavor and I love it! but you could easily substitute your favorite chili. 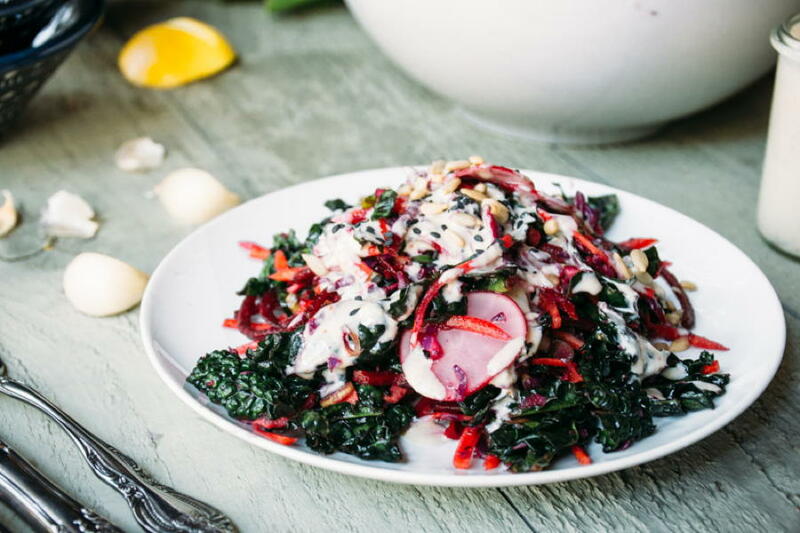 a vibrant and colorful kale salad with beets, red cabbage, radishes, carrots and green onions, dressed with a chili flecked lemon tahini dressing. 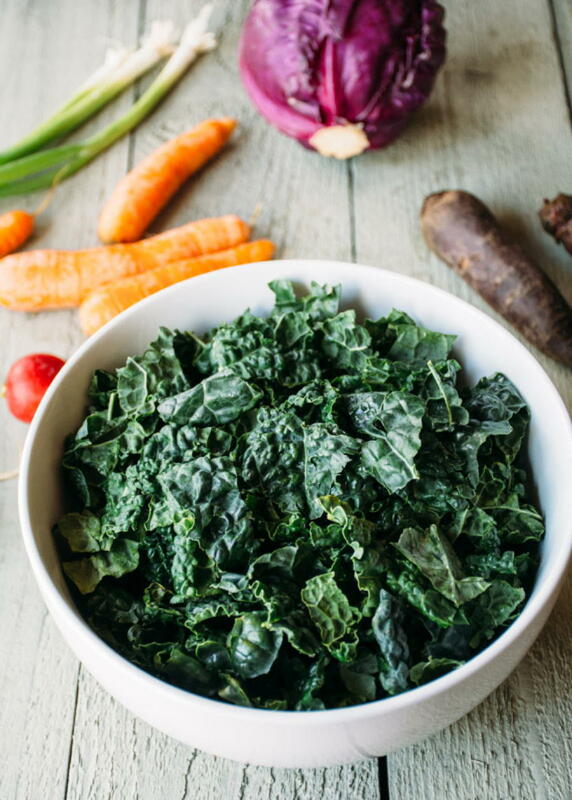 place chopped and washed kale in a large bowl. add salt, honey, lemon juice and walnut or olive oil. massage gently for about one minute, until the leaves have started to break down and are more tender. add all the shredded vegetables + green onion and toss to combine. if serving immediately you can also add the sunflower and sesame seeds at this time, if not, keep them separate until you are ready to serve. 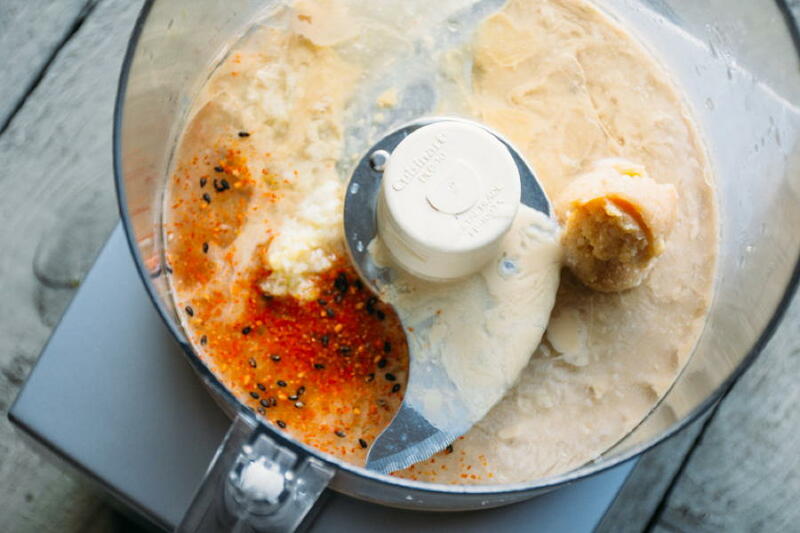 combine all ingredients for the dressing except water in a food processor, and process until smooth. add water one tablespoon at a time until desired consistency is reached. 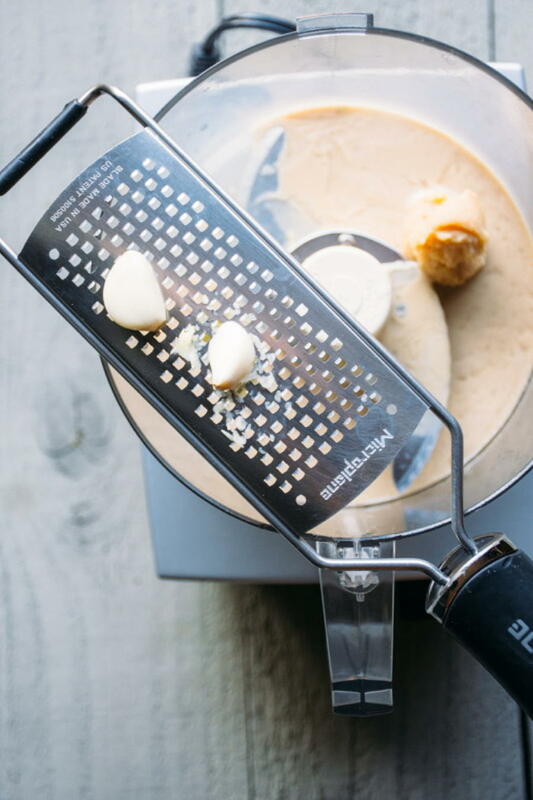 different brands of tahini have different levels of thickness, so the amount of water needed will vary based largely on this factor. 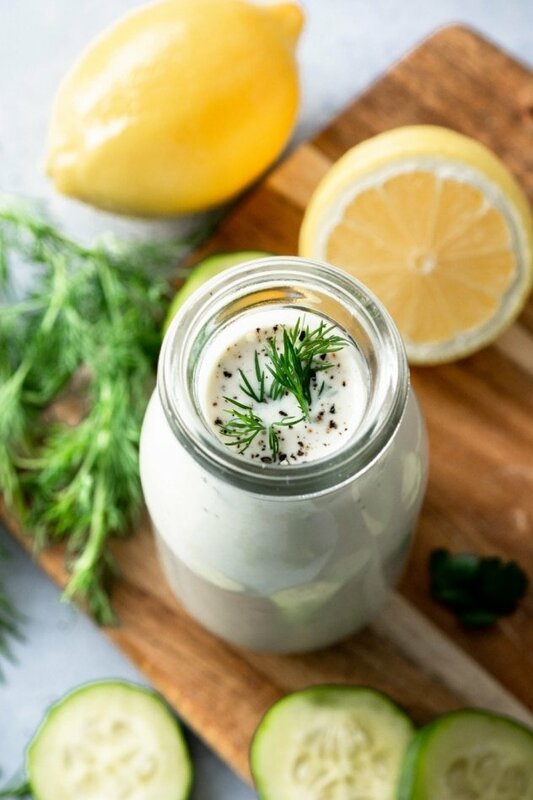 taste dressing and adjust salt, lemon and chili if necessary. when ready to serve toss 2 tbs sesame seeds and 1/4 cup sunflower seeds with the vegetables. portion onto plates or bowls, spoon dressing over the top and garnish with a little more sesame and sunflower seeds. 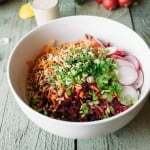 This entry was posted in lunch, salads, side dishes and tagged garlic, gluten free, healthy, lunch, salad, vegan, vegetarian on December 7, 2015 by Nyssa Tanner. Hi Adin! all those ingredients get added to the kale leaves before you massage to break them down as listed in the first recipe instruction 🙂 then you add the shredded veggies. enjoy!! I’m so excited to see such an elegant raw kale salad! I am used to massaged raw kale salads with avocado, but it’s inspiring to see one that I could actually serve to guests, and one that won’t leave my hands all greasy from trying to manually wilt the kale.